Wining and dining: Traditional cuisine with international influences. At the Residenz Hotel our restaurant, bar and lounge provide for the culinary well-being of guests. Our chefs prepare regional and international dishes fresh every day, served in the contemporary, elegant ambience of the hotel’s restaurant. And during the summer our barbecue evenings on the terrace are a special highlight. In the bar and a lounge we serve snacks, regional wines, refreshing cocktails and elegant beers. With dishes which change every month, our regular ‘Schnitzel Tuesday’ and our ‘Burger Thursday’ even regular guests will always find something new to enjoy. The Seaside breakfast buffet is available Monday to Friday from 6.00 to 10.00, and from 7.00 to 11.00 hrs at weekends and on public holidays. We serve traditional dishes from Saxony and international cuisine Monday to Saturday from 18.00 to 22.00 hrs. Why not take a look at our culinary calendar, which takes you on a different journey of discovery every month! In summer you can enjoy an unforgettable barbecue on our terrace. Treat yourself to irresistible grilled meat, tasty sausages and fresh salads! After an eventful day you can relax in our bar with beer and wine from the region, cool drinks, freshly mixed cocktails and snacks. 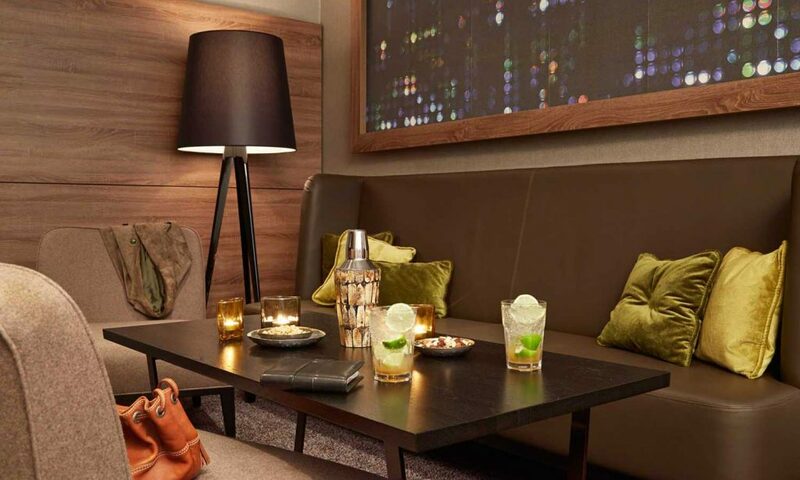 Our lounge invites you to linger at any time of the day. It’s the ideal place for a stimulating conversation or a good book. Make your stay even more enjoyable with coffee and cake or wine and cheese – whatever you prefer! “Moments of happiness are the ideal gift” – we will be happy to provide you with a personal voucher for an enjoyable stay at our hotel and delicious meals for you to present as a gift! You can contact us on Tel. +49 371 3551-0 or by email at info@residenzhotelchemnitz.de. Regardless of whether you are planning a birthday with a small group of family and friends or a major anniversary on a large scale, we can offer you the ideal facilities for a perfect event! You can look forward to an attractive setting, culinary delights and a team which will make your every wish come true. Our rooms can be flexibly arranged to suit your individual requirements. If you are looking for the right ambience for your private event, then we have what you are looking for. We’ll find the perfect location for you at our hotel.